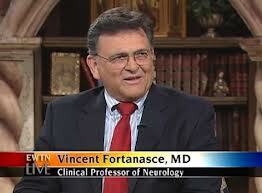 Trained in psychiatry at the Institute of Living, a Yale Affiliate Hospital; in Neurology at University of Southern California (USC); and in Neurological and Orthopedic Rehabilitation at the prestigious Rancho Los Amigos Hospital; Dr. Vincent Fortanasce is a Clinical Professor of Neurology at USC, a renowned bio-ethicist, author, and radio show host with twenty years experience dealing with medical issues on a national and international level. His rehabilitation center was ranked in the top 10 on the West Coast in 2003, and Dr. Fortanasce was selected as in the top 100 physicians in Los Angeles County and Best Physicians in the USA. Over the past decade, he has treated such notables as the Dali Lama and Pope John Paul II, Tommy Lasorda and Sylvester Stallone.